Red leaves. 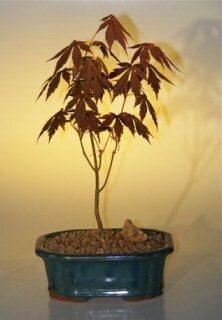 This is the famous Japanese Maple which has finely dissected palmette shaped leaves (deeply cut like the palm of the hand). Beautiful tree that will lend a soft, delicate texture to a patio, deck, balcony or garden. Deciduous. Keep outdoors.